Description of item for sale. Single Val Saint Lambert flower vase. The vase originates from Belgium and was made in the VSL factory around 1960. It is made of lead crystal with green and cut to clear tops. The object is in mint condition. The VSL signature can be found on it's base and the sticker is still attached to the side of the vase. The sticker is not mint but can still be read nicely. Dimensions: Dm 6.5 cm - H: 20 cm - weight: around 800 gram's /. X Dm 2.5 in. Items ordered will take around 7-14 days to arrive in the USA. A pick-up in person is possible in our Warehouse in Wingene, Belgium. 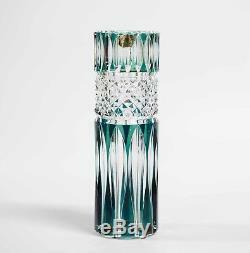 The item "Val Saint Lambert Green Cut to Clear Flower vase in lead crystal glass" is in sale since Tuesday, May 22, 2018. This item is in the category "Pottery & Glass\Glass\Glassware\Cut Glass\Vintage". The seller is "antiquesbelgium" and is located in Wingene. This item can be shipped worldwide.